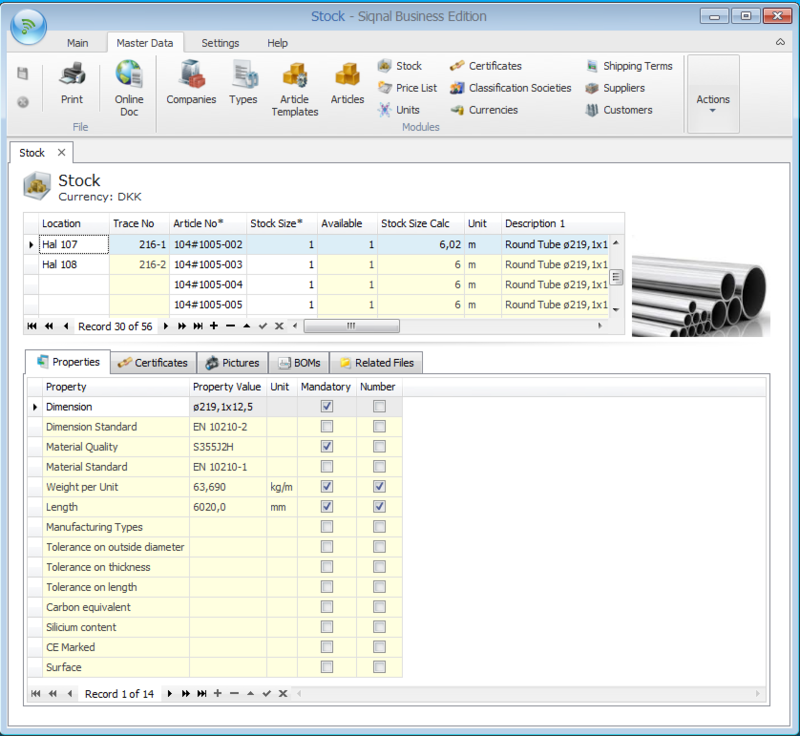 Stock is the module that contains the company stock. When a new article is purchased or registered, a stock variant number is automatically assigned that is unique based on its template type from Article Templates. This number can be changed as long as it is a unique article no. The article no is automatically created from purchases, when the properties do not match any existing article and the article no created will be using the template article no and a counter, for instance: Angle Bar#10000-1. Actions shows functions for the module Stock. - Article Stock No*: Automatically suggested but can be overwritten. The field is mandatory. - Stock Size*: The initial stock size. The information can be changed until the article is consumed by other modules. Unlock Stock Sizes: Is only to be used for stocktaking. The stock quantities are locked, unless unlock is checked. In case of inconsistency in the physical quantity and the registered quantity, the quantity can be changed when unlocked. The stock size cannot be decreased by less than the available size. Stock Certificates: By activating the button, displays a new window with all articles with certificate. 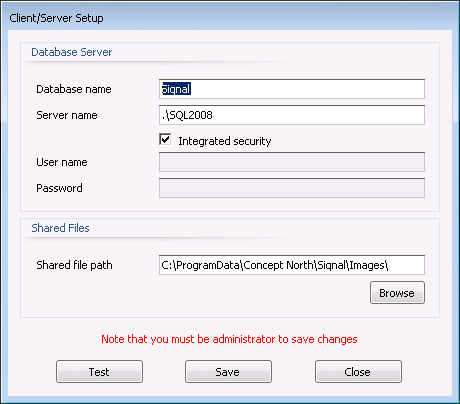 It is possible to open the certificate with the column Open File. Location: The physical location of the stock articles. If the article is located on more than one location, all locations must be entered, for instance separated by commas. Company*: Mandatory, but only visible when multiple companies are defined in the Companies module. Article No*: The stock article no. Stock Size*: The physical stock size - will be increased when articles are received in the module Reception. Available*: Shows the available stock size, which is the stock size minus reservations. - pcs = Stock Size is the same as Stock Size Calc. - m = Stock Size is shown as pcs and Stock Size Calc is shown in meters. - m2 = Stock Size is shown in pcs and Stock Size Calc is shown in square meters. Unit: The consumption unit of the article. Description 1/Description 2: Shows the formula result of the article based on the article type, including static and dynamic properties. If no formulas are used, the description is entered manually. Web Page: Optional url to a web page that contains information about the article, for instance the manufacturers homepage. Item Weight (kg): The weight of one article. Total Weight (kg): The total weight of all articles. 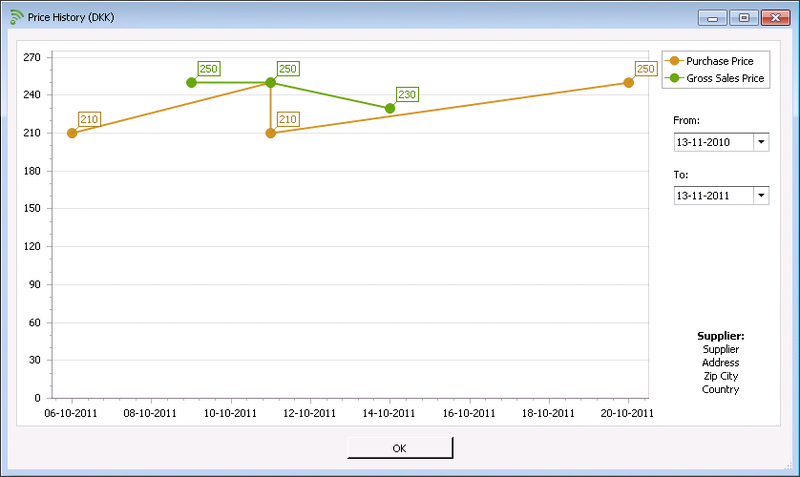 Qty Calc: Is a calculated field and is the used for calculation of the Total Cost Value for the line. Total Cost Value: Shows the Total Cost Value of the line, and is a calculated field. Properties tab: Shows article properties.